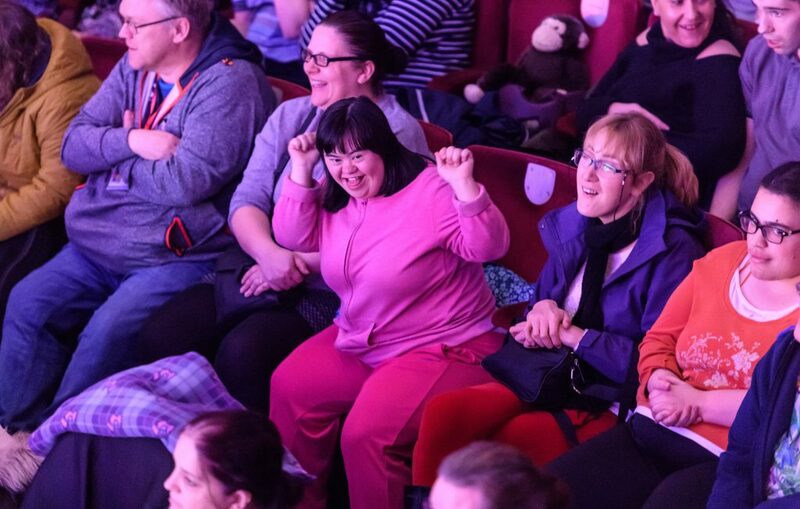 To highlight World Autism Awareness Day, we wanted to share a guest blog by Vicki, part of Open Theatre Company and star of our Relaxed Performance film. 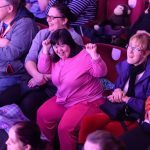 She attended the Relaxed Performance of Peter Pan in January and wrote a fantastic review about her experience. 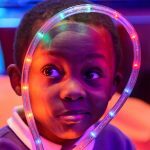 My name is Vicki ‘Rainbow’ Taylor and I am a Birmingham based actor, poet, academic and overall theatre maker! But what makes me most special when writing this review is that I am a neurodiverse (autism, ADHD, Learning Disabilities etc) reviewer who has multiple disabilities. 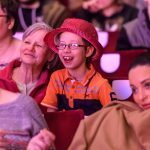 This means that I sometimes react to performances in a unique way and really understand the value of Relaxed Performances! 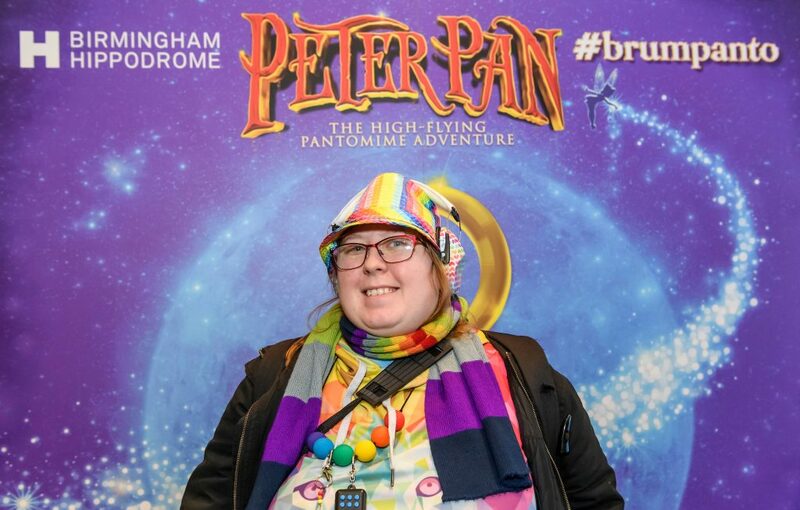 I attended the Relaxed Performance of Peter Pan at Birmingham Hippodrome on Wednesday 23rd January 2019 accompanied by Marlien, Carl, Luke, Jake and Michaela from Open Theatre Company and we were sat in two of the boxes on the right side of the auditorium. 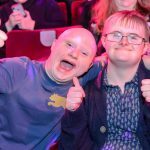 As part of Open Theatre Company, we have a very positive relationship with Birmingham Hippodrome and I have been involved in the Relaxed Performances, which included interviewing the cast, supporting the training given to staff and volunteers about the Relaxed Performances, and welcoming the audience on the day. 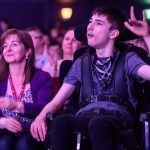 This year, I have gone into schools to do promotional workshops and have also been asked to write a review of the Relaxed Performance from the perspective of a neurodiverse and disabled audience member. 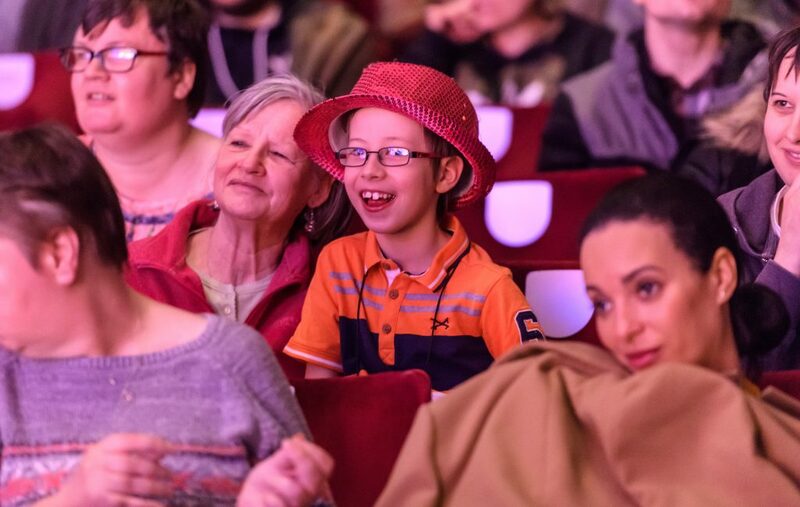 On arrival at the theatre, the foyer was buzzing with excitement as school groups and general public members were greeted by staff members and volunteers wearing sparkly hats. Of course, I wore a rainbow sparkly hat as my special interest is rainbows. After welcoming the audience we went to find our seats in the auditorium. The staff were all very friendly and showed us to our seats in the boxes. I felt like royalty! In the auditorium, the crowds came in and filled up almost all of the seats. Everyone seemed to be so excited and were happily playing with toys that the theatre had lent to them to fiddle with throughout the show. From the box, we could see the entire auditorium and it was lovely to see so many happy faces and chattering amongst the crowds. Before the show began, Matt Slack came on stage and explained to the audience all of the special adjustments that are made to make a Relaxed Performance so special, such as the house lights being kept on (but dimmed), sound and lighting effects softened, special rooms for relaxing in or having time out, and staff in sparkly hats available for any questions or problems. Matt was keen to explain that nobody gets hurt and Hook is not really a mean man. He introduced Claire the BSL signer, the caption man, and the music man and then demonstrated the pyrotechnics. The opening scene was full of energy and was a great way to engage the audience. I particularly noticed the projection on houses with silhouettes of children in bedrooms. This helped me to picture the scene of the children telling stories at bedtime and settling down for adventure-filled dreams! The overall performance was really good with some very impressive elements and some exceptional acting and entertainment. The costumes were very extravagant and detailed and the quality of the production was very high and I was genuinely engaged and gripped by the action presented on stage. Having seats so close to the stage meant that we could really see the detail in the facial expressions of the actors. Even the younger children were very emotive and reacted to every word uttered by their fellow cast members. Being this close also meant that I could appreciate every reference to rainbows such as the projected rainbow and the rainbow hood and band on Mr Smee’s costume! As a rainbow lover, this particularly made me feel happy. Having had the benefit of seeing this production before (but not a Relaxed Performance) I could really appreciate the exceptional adjustments that have been adopted to make this show as accessible as possible. In particular, they didn’t use the flashing white lights when Hook was on stage. I actually think that the performance was improved without the flashing lights and it made the show much more accessible and less overwhelming. I believe that the flashing white lights do add an element of tension when Hook enters for the first time, but tend to be over-used which actually makes the performance less enjoyable. Having the Relaxed Performance without those lights, it enabled the audience to be able to focus on the acting rather than being overwhelmed by lighting effects. I would like to give particular mention to Claire the BSL signer as she always works hard to make the Relaxed Performances really accessible and I am always amazed at how accurate she is- especially with the speed of the tongue twister! Although quite scary, the crocodile, ship and scooter bike were impressive features of the production as they come out and above the audience. The crocodile in particular adds a sense of fear but also a spectacular sight and has so much detail in the materials used to create it as we could see close up from the box. Sitting in the box felt very special and meant that I was not overwhelmed by the crowds. I also appreciated the small break out space behind the boxes where we could relax during the interval and when I needed some breaks during the show. The acting was of a very high standard and acrobatics are always a good element to include in the show especially when Matt Slack gets involved too. 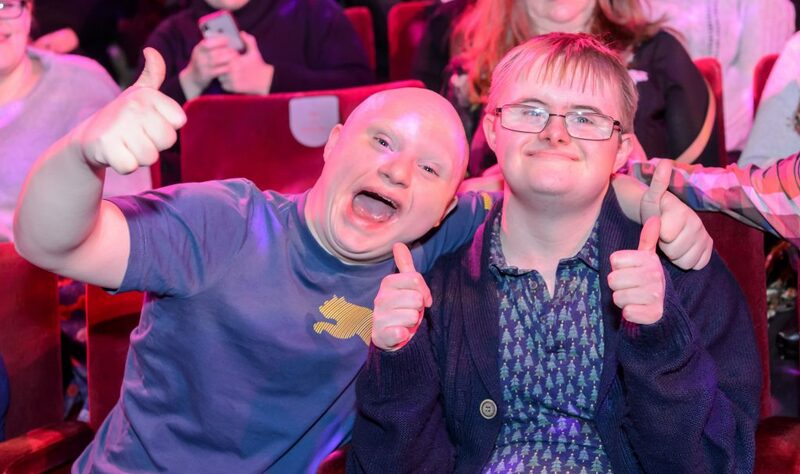 Matt always appears to go above and beyond his comic role within the show and is certainly an aspect of Birmingham Hippodrome’s pantomimes that draws the audience in! For example, Mr Smee had a series of flags and a music sequence which were particular highlights of the pantomime but one of the most empathetic moments was with the guitar. Audience members with autism like me, often take things literally and this can cause confusion in a world of metaphors and so Mr Smee’s literal actions of “take it away” was a really nice touch to the show which the audience can genuinely understand and connect to. 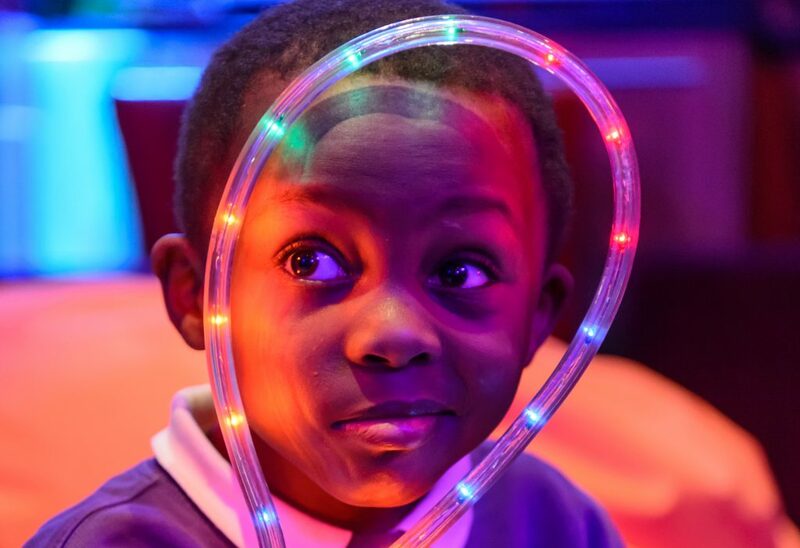 It is connections like this, that make the show such a success and a spectacular experience for neurodiverse audiences. I must mention that the flying with Peter Pan, Wendy and the Mermaid were naturally magical moments and the songs were very catchy and well performed too. I really do have a massive appreciation for the Relaxed Performance elements of this show and the cast cheering the audience was a particularly nice moment. But one thing that will stick with me for my lifetime was when Jaymi Hensley (Peter Pan) noticed me in the box and waved at me and put his thumb up at the end of the show. 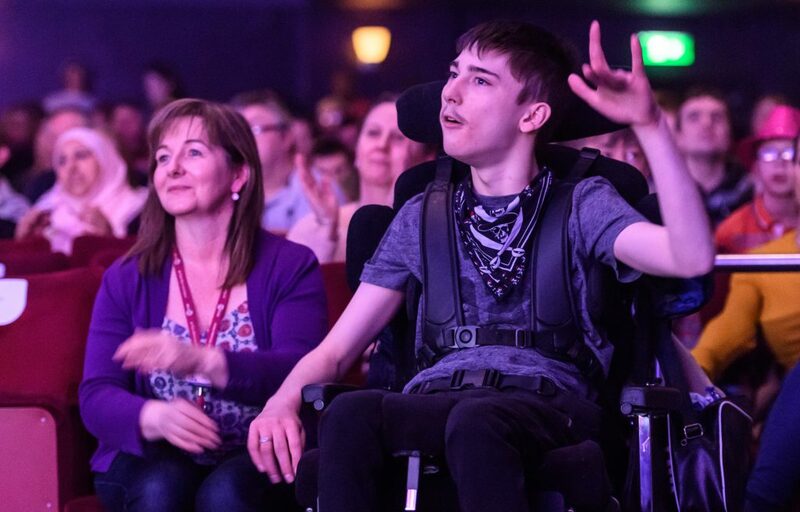 The venue has clearly considered all the ways in which the theatre can be more accessible to neurodiverse and disabled audiences with a range of adjustments including turning the hand-driers off, having break out sensory rooms, live recordings, information DVDs, cast interviews, promotional workshops for schools, clear and accessible signage, visibly recognisable staff (sparkly hats), staff training and reasonable adjustments. I genuinely believe that Birmingham Hippodrome is the leading theatre venue for Relaxed Performances in Birmingham. Find out more about our Relaxed Performances on our website. No comments have been received for this post. Be the first to leave one. All reviews will be moderated and may be edited before they appear on the website.